The Nobel Peace Prize 2016 has been awarded to Columbian President Juan Manuel Santos for his resolute efforts to bring his country’s 50 year old civil war to an end. It was a war that left over 220,000 dead and over 6 million displaced. A laudable effort by no means! So, this was the winner’s story in brief. Has anyone even bothered to find out who lost out in the race to 2016’s Nobel peace Prize? Who could have made it in the panels of history and yet did not? Who were these noble souls who did such great service that got them Peace Prize nominations? This is the story of that loser, who in no way can be called that, simply because what they do is death defying. Their service to their nation and its citizens are unbelievable and selfless. They are the WHITE HELMETS. Their motto inexplicably would be; “When the bombs rain down, we rush in to save”. You would have few days back read in a blog by an INLEAD faculty about the plight of Syria, a great historic nation ravaged by civil strives and terrorism. The story begins from there. Syria is the most dangerous place on Earth, and on an average the country is ravaged by anywhere from 50 – 80 barrel bombs daily from ISIS or from the Russians or from President Assad’s troupes. While the ones who bomb feel they have done their bit in supporting their own selfish cause, the losers are inevitably the common citizens who get trapped under debris and perish. In a country where public services no longer function, Syrians had given up hope of seeing that rare light at the end of the tunnel. It was in these hours of despair a bunch of young Syrian men came together to help save people who get caught in debris. They are fully aware that more bombs may fall on the same site, yet pulling out people from under the rubble is what they do. They say it’s the call of Allah. They train in Jordan and Turkey in areas like cutting through boulders and iron bars, fighting fire, handling babies trapped in unlikeliest of places under the debris, giving on the spot paramedic support, and so on. They are absolutely unfathomable in their energy to surge ahead under trying circumstances and in their passion to help the affected. They are young, have families who are equally vulnerable, do not know whether they will see the sunrise the next day, yet they remain undaunted. Even one life saved is a blessing they seek. 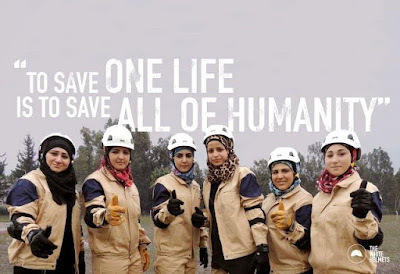 Since the war began, White Helmets have saved close to 62,000 lives in Syria. But they have lost more than a hundred of their own brave soldiers. A small price to pay they say in a country where hopelessness abounds. An Oscar nominated team from Hollywood decided to pay ode to them, and for once and for all shift the world’s focus away from ISIS and bombers to the White Helmets and their selfless acts of bravery and sacrifice. They have produced a documentary on White Helmets, which is currently streaming on Netflix and they had also been working really hard to get this group the Nobel Peace Prize this year. The White Helmets may have lost the Nobel Peace Prize, but the world is a winner in having amongst it such brave sons of the soil.